WHAT IS IT? Atopic dermatitis is a common skin disease frequently seen in allergic patients, especially young children. 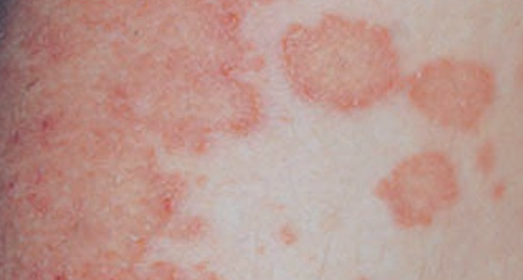 It usually begins in infancy and consists of itchy, red patches on the skin that may crust, scale or ooze. As many as 50% of patients may outgrow this disorder. In the very young it usually involves the face, torso and outside of arms and legs. In childhood the rash may affect the elbow and knee creases, neck, wrists, ankles and feet. In adolescence, the rash may be more prominent on the hands, feet and face.WHAT CAUSES ECZEMA? The exact cause is unknown; however, it tends to run in allergic families. The skin in people with eczema cannot hold onto water like normal skin. Allergies to common food and inhaled allergens can make eczema worse. It then becomes important to avoid foods that have been identified as playing a role, and good environmental control begun as early as possible. HOW DO YOU TREAT IT?“Soaking and greasing” is very important. First, use only a milk soap such as Dove or no soap at all. Tepid water rather than hot water is recommended as hot water may cause itching. Use of bath oil such as Alpha Keri bath oil or cottonseed oil is good to soak in. Patients may bathe 1-2 times per day. After getting out of the bathtub, pat dry instead of rubbing dry. Immediately apply a moisturizer to lock in the water. Good brands are Vani Cream, Aveeno, CerVa, Exederm, Lubriderm, or another cream that has been prescribed by your doctor. Soft cotton fabrics are recommended as some wool, silk, or polyesters may be scratchy and cause itching. Mild soaps and detergents should be used for washing clothes and fabric softeners should be avoided, as these can be irritating to the skin. Avoidance measures should be implemented when foods or inhaled allergens such as dust mite or pet dander have been identified. Foods which are suspected or have been proven through an elimination diet to aggravate the conditions: dairy products, eggs, chocolate, tree nuts, peanuts, peanut butter, tomatoes, ketchup, and other tomato products, citrus fruits and juices. Oral antihistamines help reduce the itch associated with eczema. It can cause drowsiness but usually clears up after being on the medication for a few days. Apply topical steroids as directed by your physician. Antibiotics may be needed as infections can frequently occur with this disorder in all stages. These infections produce redness and itching and may cause crusting, oozing and ulcers.